Exploring the cyclical nature of life, costume artist Kodue Hibino’s exhibition 60 at Ichihara Lakeside Museum showcases 50 of her wondrous designs. The title was chosen because 2018 marks her own 60th year, a significant turning point at which she says she has discovered her true reason for making clothes and costumes. (The 60th birthday also symbolizes rebirth in Japan, as the person has made it fully through the cycles of the Chinese zodiac.) Hibino, known for creating outfits for TV programs such as NHK’s Nihongo de Asobo (Let’s Play in Japanese) and stage performances such as the Hideki Noda plays Egg and MIWA, is the recipient of the Mainichi Fashion Grand Prix Award and the Shiseido Honorable Award. Prior to becoming a costume artist, Hibino studied design at Tokyo University of the Arts, aiming to become an art director. Her education in the 1980s was not merely about drawing lessons in school, but also constant exposure to exciting moments on the streets of Tokyo. Costume design has proven the ideal medium for Hibino to channel her originality and express her unique style. On top of costumes, she continues to explore new fields of industrial design, including sportswear, furniture, and eyeglasses. In 1993, she started designing handkerchiefs, and added product development to her skill set in 2000. She has always believed art goes beyond “display” and seeks to transform art into practical objects. At the entrance of the museum, visitors are welcome to try on a few of her costumes. “60” exhibits major works such as Live Bone (2010). Hibino’s idea of creating a bone costume coincided with the passing of the mother of Kaiji Moriyama, the dancer with whom she was collaborating at the time. The “bones” of the costume then became an emotional expression for the dancer himself. Moriyama continues to dance in Live Bone at various venues. The performance is known as The Dancing Organs, which is also a series for the NHK educational TV program Karada de Asobo (Physical Play). Wonder Water (2017) is a series of imaginary underwater worlds that Hibino created for the 2017 Oku-Noto Trienniale at Suzu City in Ishikawa Prefecture. At the Ichihara gallery, the moment you enter the exhibition you are immersed in another realm. The room is filled with dim blue lights moving in mysterious ways. Costumes hung from the ceiling sway slowly, giving the impression of sea creatures floating in the ocean. The way the fish, jellyfish, and seaweed are displayed make the costumes look like living and breathing objects. 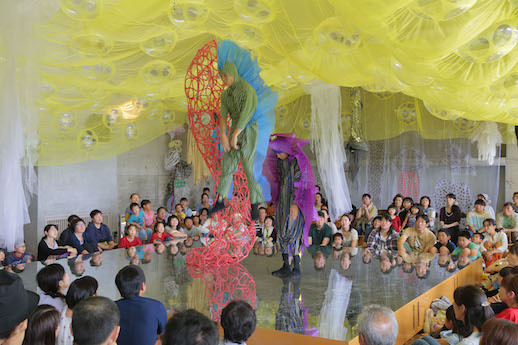 To draw inspiration from her own experience, Hibino dived into the sea at Suzu, where she conceived the idea of “in between gravity and zero-gravity.” In order to integrate this notion into the installation, she produced a series of performances where she invited dancers to wear her clothes and bring the costumes to life. FLY, FLY, FLY, presented at Ichihara Lakeside Museum on April 21, is a performance in which Hibino collaborates with musician Kawase Kohske and dancer Yasutake Shimaji. The dancer portrays the cycles of life with emphasis on acrobatic body expression. With resonating beats from the music, the dancer’s fluidity complements the harmony between the human form and the costumes. The theme and music shift as Shimaji puts on another costume and creates a different mood and storyline. It is magical when the dancer and his costume merge seamlessly into one and move freely, sending the message that clothes and people are inseparable. Hibino also expresses herself in work including magazine and poster design, TV commercials, theatre, dance, ballet, and film. She continues to expand the possibilities of costumes and defies the idea of art as objects merely to be looked at. Rather, she makes an effort to incorporate human bodies and modes of communication as important elements of her art. Her creations are energized and vitalized by dancers, who transform them into installations that can be appreciated by people of all ages, whether they are familiar with art or not. By making everything wearable, Hibino redefines the image of the costume. This exhibition offers ¥100 discounts with MuPon museum coupons for the TAB app and Android.